Limited Lifetime Manufacturer Warranty w/ US Based Customer Service. 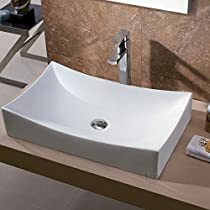 Beautiful looking and clearly works with high end vessel sinks. 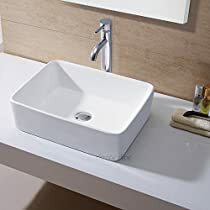 Elongated drain and very polished connector is appreciated (as my vessel AND vanity are glass and all the connections are visible. 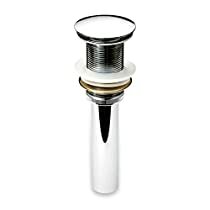 Its works with standard 1-1/4" P-traps so you don't have to worry about special connectors from a plumbing supply store. A few things that make this a poor piece. 1) the tailpiece is thin 20-22 gauge tube-it WILL rot out. 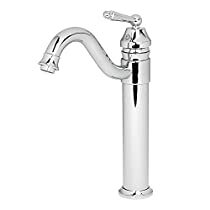 2) The tailpiece tube is flanged, and because it is 11/4", it will be easier to find plutonium, than a replacement tube( note: a standard lav tailpiece is 11/4", 18 gauge tube and has fine threads that screw into the drain body) Although I confirmed it will fit the drain hole of "traditional" USA market lavs, some vessel sinks may have a drain hole too small to accept the 11/2" throat on this drain. Impossible to beat for the price. What's not to like? It's beautiful, fits very nicely and does the job it was intended for. Really like the fact that it has a nice neoprene gasket/seal so that I didn't have to use any messy silicone.